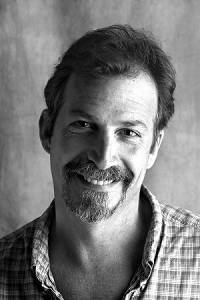 Daniel Wallace is the author of three novels: Big Fish (1998), Ray in Reverse (2000), and The Watermelon King (2003). His stories have been published in many magazines and anthologies, including The Yale Review , The Massachusetts Review , Shenandoah , and Glimmer Train , and his illustrated work has appeared in the L.A. Times and Italian Vanity Fair . Big Fish has been translated into 18 languages and was adapted for film by Tim Burton and John August; it is now available on DVD, loaded with extras. Born in Birmingham, Alabama, Wallace lived there until going off to college—Emory University and then the University of North Carolina at Chapel Hill, which he left shortly before graduating. After living in Nagoya, Japan for two years (in a valiant attempt to succeed in business) he moved back to Chapel Hill, where he bought a typewriter, got a job in a bookstore, and began to learn to write. Thirteen years and five unpublished novels later, Algonquin Books bought Big Fish . For a number of years he supported himself as an illustrator, and his designs may to this day be found on refrigerator magnets, pins, T-shirts, and greeting cards, distributed through K. FLOYD Designs. Wallace currently lives in Chapel Hill with his wife Laura and his son Henry, who is almost 12. The following interview was conducted over email during July 2004. Jason Erik Lundberg: All right, I'll get this out of the way at the start: how did it feel having Big Fish turned into a feature film by Tim Burton? Daniel Wallace: I could not have been happier—or more surprised. I thought the narrative was off the Burton beaten path, and it was, but he saw the magic in it. For me, personally and professionally, it was a great and very lucky event, because my books are small, quiet and literary, and therefore don't have a wide readership. I have a lot more readers now, and this is what I always kept in the back of my mind, throughout the entire process: people are going to read my book. JEL: How involved were you in the screenwriting process? DW: Not very. John [August] sent me drafts as he completed them, but I had very little to offer by way of changing or improving them—he is very good. My main contribution I think came before he ever started; we had a long conversation about it, a transcript of which can be found here. JEL: A question about the ending of Big Fish : the film takes the literal ending of Edward Bloom's transformation and turns it into yet another tall tale. While both endings work very well, it changes the overarching theme from a son's mythologizing of his father into a story about how we tell stories, and that sometimes the myth can overwhelm the reality. How do you feel about this change? DW: My feeling is that it's nice to be able to have it both ways. Obviously, I prefer my ending to John's ending, but I imagine John prefers his. I think one reason the movie was as good as (I think) it turned out to be is because he brought his own vision to it. The fact is, more times than not, a screenwriter is hired to adapt a property that some studio has purchased, and so he may not have any real relationship to the material. With Big Fish , John is the person who read the book and persuaded the studio to buy it. But back to your question. In the book it remains somewhat vague, where all these stories come from. Clearly some come from the father, some come from the son. The son's mythologizing of his father is encouraged by the father, at the very least. So that theme is there. In the end, though, it's impossible to make a big Hollywood movie unless the characters are seen to be on some kind of quest. The father's quest is to be a big fish in a big pond, and the son's quest is to see through his tall tales. Had John stuck to the predominant theme as presented in the book, the son wouldn't have the same clear quest. I would basically agree with this guy. It's hard because the final river scene of the script has had two very different contexts over the years. In the original version, Will was just telling the story to us as the audience, while the final version had him telling Edward the story—so both Edward and Will acknowledge that the trip to the river isn't what's actually happening, but what should be happening. I know a lot of people feel that the Will character in the book is mythologizing his father, building him up as something he never claimed to be. It's true that the movie plays Will's frustration with his father's tales more strongly. But I think that it's mostly coming from the change in narrator perspective. The book has a single narrator—Will—through which all tales are told, while the movie says the stories are the stories regardless of the teller. JEL: Big Fish is very much about the power of myth, and the way we use it in an attempt to understand the unknowable; I even hear that an early draft of the novel incorporated footnotes in order to explain the myths told by Edward Bloom. Where did your fascination with myth originate, and what are some of your favorite myths? DW: Myths are just great stories, and they are the origin for all story, and all of our stories, literary and religious. Big Fish and some of my other stuff just works closer to the bone than other writers do—which is not necessarily a good thing. But I have always been aware that where there is a story there is someone telling it, and that the person telling the story is a part of the story, and to pretend otherwise is pretense. Edith Hamilton's Mythology , [James G. Frazer's] The Golden Bough —these books and books like them illuminate the universality of story and the invention of god and religion as part of story—our story. I've always been partial to The Odyssey , the book and even the cheesy movies that have been made about it. Perseus. But I could go on and on—there are so many, and they are so interesting, and so much fun to read and to think about. JEL: But where did your personal fascination with myth begin? Was it a book given to you as a child? Was it stories your parents would tell? DW: Well, that's a hard one. The closest I can figure is this: in Birmingham, there's a big iron statue of Vulcan. A very big presence in my life. I know this sounds like a joke, but it isn't. JEL: That statue of Vulcan actually plays a very important symbolic part in the second section of The Watermelon King , where Thomas Rider is trying to find out what happened to his mother, but his grandfather tells nothing but tall tales about his birth. This was a theme you explored in Big Fish as well: relating to a father-figure who could never give you a straight answer. Does this stem from your relationship to your own father? DW: Yes. It appears that I am drawn to stories about father/son relationships. This also appears to be totally out of my control. It does/must stem from my own relationship with my father, which, while not too personal a question, is one too complicated to get into here. He was in many ways like the father in Big Fish —charming, but using that charm to keep others at bay. JEL: Okay, on to Ray in Reverse . What was the impetus behind telling a story in reverse order? DW: Books take on little lives of their own, and while this is a cliché by now it is in my experience true. I know many writers say that their characters begin to say and do things out of their control, but the life I refer to—and the life that happens—is what happens to the structure of a book. A book finds the best available way to tell the story it want to tell. Ray in Reverse began as a lot of stories (so did Big Fish ). Stories about one guy: Ray. I had to figure out how best to present them so that they told his story in an original way: not simply to be original for its own sake, but because originality allows an old story to be told in a fresh way (there are not that many stories to tell). Understanding Ray's life as, if not a waste, then very badly done; moving backwards through it, as opposed to the normal way, allowed me (and the reader) to clearly see where he went wrong, if he did, and the chances that he had to be different, and how the choices he made are what made him who he was. By the end of the book we see the sweet, pure good boy he started as. This is poignant to me. JEL: That's one thing I noticed about Big Fish and Ray in Reverse : they read more like short story collections or mosaic novels than typical straightforward novels. So where is that point for you when a group of stories becomes more than that, and starts to turn into a novel? DW: I don't know if it's possible for me to write a novel in the traditional way and do it successfully. I tried. I wrote five of them before Big Fish , and none really worked out in a good way. I finally had to come to terms with my strengths and weaknesses as a writer, and realized that if I continued to attempt to write a "real" novel, I would never publish—but more importantly, never write anything of real value. So I threw away this idea of what was right and wrong and now write the kind of books I imagine, the kind of books I would like to see in the world. The Watermelon King is no different. Style is understanding what you're good at and doing that. JEL: All of your books are fairly short; The Watermelon King is the longest at 226 pages. Is this another function of your authorial style, or is there another reason you are averse to writing longer novels? DW: I'm not averse to longer books really. I think I'm just impatient. I tell this joke where I vowed never to write a book longer than the page at which I stopped reading Joyce's Ulysses , but it's a joke that has turned out to be true. JEL: In The Watermelon King , you revisit the fictional town of Ashland, Alabama, which was made famous in Big Fish , though you've given it a dark undertone in the newest novel. What is it about small towns—and Southern small towns in particular—that compels you to keep writing about them? DW: This is an interesting question, and one I don't know that I can answer. I grew up in a city—Birmingham—and spent a few weeks (if that) out of the year in Cullman, AL, where my grandparents lived. Ashland is derived from this experience. Weird to me that I would be drawn to this, because I am otherwise not . . . I wish I understood myself better. . . .
JEL: Your novels all contain subtle magical elements, and your fiction is often set in the American South. Is there something about the South that seems to be associated with elements of the fantastic in your eyes? DW: That may very well be, but my work isn't about this larger vision of place. It's about stories and characters that take place in the only place I really know. I am not part of a storytelling tradition. JEL: Are there any plans to collect your short fiction? DW: I have a collection ready to go, but the question is when to publish it. Short story collections aren't big sellers, publishers don't always like them, and there's no real hurry. But I really want to do that. JEL: You've made a living as an illustrator, and I understand you have an illustrated book called O Great Rosenfeld! which is being published in Italy next year. What can you tell us about the book, and will it be released in the US at some point? DW: For info on the next book—which is also going to be published in France—go to www.ogreatrosenfeld.com. I am certain it will be published here in the US, eventually. Don't know when or by whom . . . yet. But one day. JEL: You've discussed your love of myth and story, but what drew you to writing in the first place? DW: That's a bit of a mystery. I don't come from a particularly literate family, or one that stressed the sort of thing I ended up doing. Clearly I have some facility for it or I wouldn't have gravitated toward it. But I think the truth is, I like to work alone. I like to produce work with my name on it, which is wholly mine. I'm not really a painter . . . so what's left? Writing. JEL: What projects are you working on right now? DW: Right now I'm working on a screenplay called I Am Cowman , about a couple of guys on the make in New York City. Maybe that will be a movie one day. JEL: Where can we expect to find Daniel Wallace fiction in the near future? DW: Stories of mine are forthcoming in The Greensboro Review , Stories from the Blue Moon Café III (ed. Sonny Brewer), Glimmer Train , and Crossroads: Tales of the Southern Literary Fantastic (eds. F. Brett Cox and Andy Duncan).